When I started experimenting with chicken and western cuisine, one of the first things I tried was stuffing chicken with variety of stuffings. And the first one I tried was using Keema (mince) as the stuffing. It was not only a totally different thing for the punjabi family, but it was also cherished and loved. This Keema Stuffed Chicken Breast had the unique combination of different textures of chicken and it had my family and kids drooling over it. Now it's hard to please kids, isn't it? Finely chopped green chilli. Skip it if you are making it for kids. First we will prepare the stuffing, For this, head the oil in the pan. Add the onions, green chillies and ginger garlic paste and cook it for 2-3 minutes till they become translucent. Now add the mince. Now when you are adding mince, add it by breaking mince else it will stick like a big loaf. Cook the mince on high and it needs to get color. If there is no color, means it will not taste good. Add the masalas and mix and cook on medium for 7-10 minutes till the keema is tender. Sprinkle some coriander and mix well. Your stuffing is ready. Don't wash the pan, we will use it. Now, you need to butterfly the chicken. 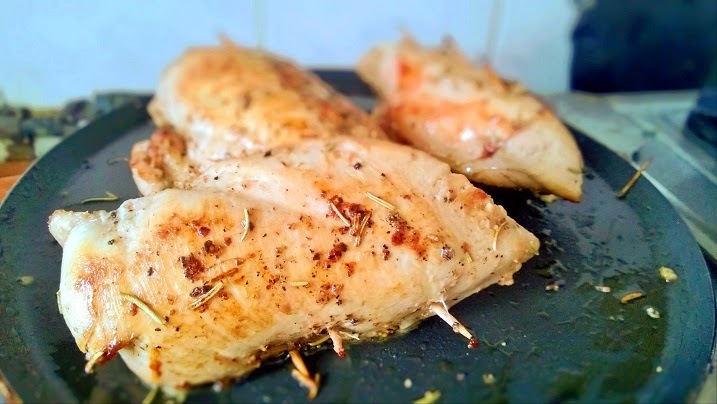 Check this recipe if Chicken Double Bed to know how to butterfly a chicken breast. Put the keema uniformly on the chicken and then close it like a book. To seal it so that nothing comes out, close it with tooth pick as you see in the picture above. Season it will salt, pepper, mixed herbs and rosemary. Now use the same pan and add some oil and also add a garlic clove. Once hot, sear the stuffed chicken in the pan from both sides to give it the color. No color, no flavor. Tilt the pan a bit and braise the chicken from both sides using a spoon to add the garlic flavor on top of it. Once it is slightly cooked, cook it in preheated oven at 200 degrees C for about 15 minutes. Take it our, let it rest for 5 minutes. Serve it with this Creamy Sauce which will just elevate the flavor of this dish. Your perfect Keema Stuffed Chicken is ready. Do leave your comments below and subscribe to my blog to that you keep receiving these new unique recipes.